rejuvenate old cells, making them look younger and start to behave more like young cells. The secret to staying youthful is eating chocolate and drinking red wine, researchers claim. Scientists discovered both helped to rejuvenate old cells, making them look younger and start to behave more like young cells. When we age, the strands of DNA in our cells gradually lose the protective telomeres, which that act like the plastic tips at the end of shoelaces. 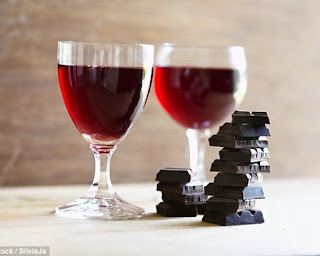 The team applied compounds based on chemicals naturally found in red wine, dark chocolate, red grapes and blueberries to cells in the laboratory. These foods are rich in flavonoids, which are known for their antioxidant and anti-inflammatory effects. Within hours of treatment, with these so-called reversatrol analogues, the older cells started to divide, and had longer telomeres. It is hoped the breakthrough could lead to anti-ageing therapies. The work of the team at Exeter University, supported by researchers at Brighton University, builds on their earlier findings which showed that a class of genes called splicing factors are progressively switched off as we age. Lead researcher Professor Harries said: 'This is a first step in trying to make people live normal lifespans, but with health for their entire life. Dr Eva Latorre, research associate at the University of Exeter, who carried out the experiments, was surprised by the extent and rapidity of the changes in the cells. She said: 'When I saw some of the cells in the culture dish rejuvenating I couldn't believe it. 'These old cells were looking like young cells. It was like magic. The research was published in the journal BMJ Cell Biology.